The Cisco CloudCenter solution is a hybrid cloud management platform that securely provisions infrastructure resources and deploys application components and data in more than 19 data center and private and public cloud environments. The solution supports a wide range of uses in enterprise IT organizations, including application migration, DevOps automation across various cloud environments, and dynamic capacity augmentation within or between clouds. It also can serve as the foundation for a comprehensive hybrid IT-as-a- Service (ITaaS) delivery strategy. 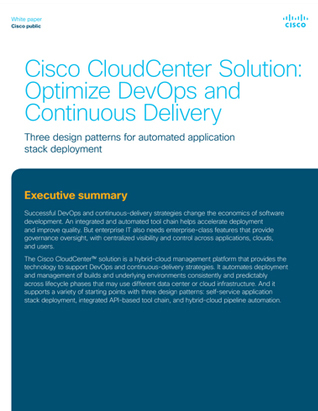 With its simple two-part architecture, the Cisco CloudCenter solution delivers fast time-to-value, and deployment does not require a major professional services project.